Kristofferson Tribute, This Frontier Needs Heroes, and R Stevie Moore Saturday Singles Club! Unfortunately, we need your help to release this amazing double album. PIAPTK Records has released 95 records over the last 6 years. However, in the next several months, PIAPTK will be dramatically decreasing releases as it’s proprietor gets ready to move his wife and 2 year old daughter into a motor home to hit the road and take travel jobs for the foreseeable future. Therefore, we have neither the money, nor the storage space required to produce a double LP. So, with 24 songs times 500 copies times $.10 each, a run of 500 double albums is $1100 just in royalties. Mastering, plating, pressing, printing of covers, shipping, etc of a double LP is close to $6,000. Meaning that all in all, this project will cost $7,100. Many of the artists involved have contributed to the cause, but we still need a LOT of help to make this happen. We are asking, no…, begging, for you to help us make this project that we believe so deeply in, a reality. While we really need $6,000, we are setting the first bar at $4,000. Anything above and beyond that will be used to make the record better, the packaging better, and to fund additional artist copies. 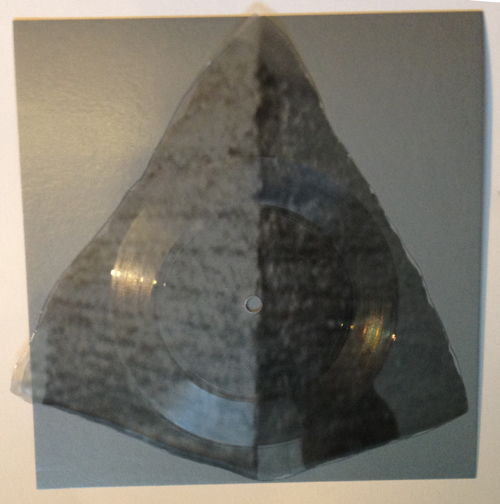 A one-sided, pyramid shaped, picture disc with a ode to the impending (or not) apocalypse. Originally released by the band as a run of lathecuts.com-cut picnic plates, PIAPTK liked the song so much we asked them if we could do the re-release. Comes with a glow-in-the-dark silkscreened insert. Will be released (arrive on your doorstep) on Sept 21, so that you will have exactly three months to enjoy it before the world ends (or doesn't). Starting this Saturday, and Every(ish) Saturday thereafter, for as long as we and Stevie feel inclined, PIAPTK will be opening up preorders for a new R. Stevie Moore clear, square, lathe cut single in a hand-set letterpressed cover. The preorders will last for 24 hours. We will then make only that many records (plus artist copies) and the single will be out of print forever. To sign up to the PIAPTK Stevie email list (separate list that will only contain Stevie-related emails) to remind ya, click here: http://eepurl.com/o2vLD . 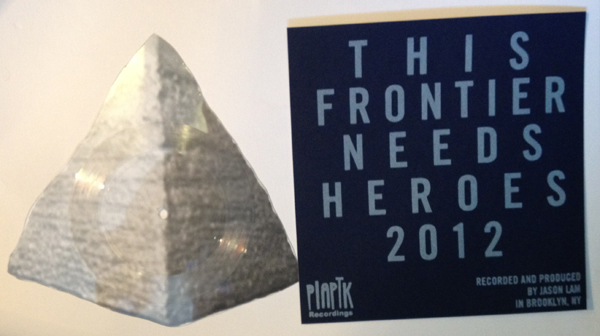 Fruit Bats, Grand Archives, and Joe Plummer contribute to PIAPTK Artist Residency! To celebrate the Seattle opening of The Record: Contemporary Art and Vinyl touring exhibit, Michael Dixon, founder of PIAPTK Recordings, has been offered an Artist In Residency opportunity by the Henry Art Gallery of the University of Washington. Dixon will spend the five-day residency cutting records in real time as a part of the “B-Side” exhibit in the front wing of the gallery. Friday, July 13th – Opening Night –The Hive Dwellers (Calvin Johnson of K Records and Beat Happening) and Slashed Tires will perform while records are cut live on a vintage record lathe. Henry members will receive free admission and will be entered in a drawings to receive one of the records as they are cut. Complimentary snacks and beer (courtesy of Hales Ales) will be served. Non-Member Admission is $10. Three Pacific Northwest Artists have donated new, unreleased recordings to be cut live and sold for $75.00, with proceeds to benefit the Henry Art Gallery (A 401c3 Non-Profit Organization). Only 40 copies will be sold, with 20 copies being made available for internet preorder at http://www.henryart.org/ at 6pm on Friday, July 13th. The remaining 20 copies will only be sold in-person at the Henry during the residency. Each record will be cut in real-time on a 1930’s Presto 6N mono record lathe (the same model that Sam Phillips used in the Sun Records studio to cut early records from Johnny Cash, Elvis Presley, etc). Each record has been autographed by the artist, silkscreened on the B-side and includes a digital download of all three records. Attendees are welcome to ask questions about the cutting or pressing process while they watch the records being made. Many thanks to Apollo Masters for their support! Artist for Wednesday, July 18, 10:00am-4:00pm – Joe Plummer – Plummer is currently the drummer for the Shins, but has also spent time in Modest Mouse, Blackheart Procession, Magic Magicians, Mister Heavenly, and Caustic Resin, amongst dozens of other bands. Plummer has contributed three songs on which he recorded all the instruments. Artist for Thursday, July 19th, 10:00am-4:00pm – Grand Archives – Consisting of Seattle indie rock veterans Mat Brooke (ex-Band of Horses/Carissa’s Weird), Curtis Hall, Jeff Montano, and Thomas Wright, Grand Archives contributed two unreleased demos that were recorded in preparation of their upcoming album. Artist for Friday, July 20th, 10:00am-4:00pm – Eric D. Johnson (of the Fruit Bats) – Johnson is the main force behind The Fruit Bats but has also performed in bands such as Califone and The Shins. He has also recently been focusing scores for films such as Our Idiot Brother and Youth in Revolt. Saturday, July 21, 12:00pm-3:00pm – Ipod-to-Lathe live cutting event – Bring in your own recording on an MP3 player and watch as your tune is cut straight to a record in real time! Then take it home! You may also bring in your guitar or other instrument and record as it cuts! Meowtain - Hex/Piggyback Rider Spin-Painted square 8"
A new, 2-song single from arty Olympia post-pop cat-fanciers, Meowtain. Each one is uniquely spin-painted and foil-stamped. One of my favorite "art-projects" to date... in advance of their West Coast tour, the band and I got together and made 50 copies of this. It got recorded, mixed, cut to disc, and spin-painted in about a week. They have 25 on tour, and I have 25 for sale. Includes a download of both tracks of the single, plus a digital copy of their 6-song debut cassette EP. Golden Boots - BeezKneez/Be My Champ 2x7" - A double 7" picnic plate release of new Golden Boots tracks... One Dmitri tune (Be My Champ) and one Ryan tune (BeezKneez) on two one-sided picnic plates in beautiful hand-silkscreened medical folders made by the band. Limited Edition of 50. The band has 25 and we have 25. Viking Moses/Teenage Mysticism Split 7" Translucent Picture Disc - These went from concept to reality in less than 3 days... Put together for a VM/TM tour which included some dates opening for Viking Moses' old protege, Deer Tick. Beautiful translucent lathe cut square picture discs in hand-made covers. Each cover has one side watercolored by Viking Moses and one side is water colored by Teenage Mysticism. Each one is unique. Only 50 made. DISTRO - Advance Base - A Shut-Ins Prayer LP - The new LP from Owen Ashworth's Advance Base project. We have a limited number in distro. On beautiful red marble vinyl in Tip-on sleeves.... Includes an MP3 coupon with the record. Find them using the navigation options to the left! Solid Home Life LP and Wooden Wand/Catherine Irwin Record Store Day 7"! After years of working on this record, the ST Debut from Solid Home Life (Greg Olin from Graves and Lindsay Schief from LAKE) is finally ready, thanks in part to the folks at Lost Sound Tapes, Fin Records and Curly Cassettes, with whom we co-released this gem. It comes on gorgeous sea-blue vinyl or cassette tape, and is full of the most sweet and sugary co-ed harmonies you've heard. Pick it up here: http://piaptk.limitedpressing.com/bands/graves/products or from one of the great labels mentioned above.